Hello and WELCOME to DELIRIUM READ-A-LONG's FINAL DISCUSSION POST! Oh boy! What a crazy and heart-pounding story this one was! I don't know about you guys, but I loved this book to pieces and am seriously amazed by how perfect, beautiful and gorgeously constructed it was! But let's save all the raves for my actual review (which will be posted here tomorrow!). Tonight, we discuss! Once again, huge thank you to all who have signed up for our second Read-A-Long this year, I hope you guys enjoyed reading Delirium with us! Thank you for all the tweets, comments and blog posts - you are all absolutely fabulous! :) Nothing compares to being able to read a fabulous book such as Delirium together with a bunch of seriously awesome people (that's right! YOU'RE ALL AWESOME!). In case you missed it, the previous discussion post for Delirium was hosted by Rachelia over at Bookish Comforts, you can find it HERE <- click! Before we move on to the discussion questions Rachelia and I have prepared for you, here's a quick re-cap of what happened! - Lena discovers that her mother didn't commit a suicide. She was held prisoner in the tombs (Ward 6) for 12 years. She also learns that her mother managed to escape not long ago. - Lena and Alex plan their escape into the Wilds. They're preparing to leave in 7 days (gathering food and clothes, etc). - Lena tells Hana about their escape plan. She asks Hana if she want's to come with them. Hana says she can't leave everything behind. - Few days before their escape, Lena and Alex run into raiders. Lena is captured and held captive at home. Her procedure is rescheduled to an earlier date. - With the help from Hana, Lena gets a message to Alex about her procedure. On the night before the scheduled procedure, she escapes (with the help from Gracie and Alex). - When trying to escape, Lena and Alex are cornered by the police. Alex tells Lena to jump off the bike and climb over the fence into the Wilds, promising to be right behind her. When Lena climbs across, she turns around and sees Alex on the other side of the fence. Captured. OMG! Talk about dramatic cliff-hanger ending! So glad I have Pandemonium on my shelf, I definitely will be reading it ASAP! 1) Were you surprised that Hana would not go with Lena & Alex into the Wilds? Do you think we will see Hana again? 2) Gracie helped Lena escape, and also broke her silence in the process. Can we interpret her silence then as her own form of resistance all these years? Why or why not? 3) What did you think of Alex's sacrifice in the end? 5) Where do you think is Lena's mother now? Do you think she managed to make it to the Wilds? 6) What do you make of the last passage in the book and Lena's promise to remember and to resist? Can you think of any ways she could try to free Alex? 7) What do you think will happen in book two? 8) Which character in the book did you identify with the most? These are all the questions we have for you! Please leave your answers in the comments below. Feel free to break them apart (1 comment per 1 answer! ), or omit the questions you do not feel like answering! I am looking forward to discussing Delirium with you guys! I have upgraded my comment system to Disqus so that we can have a more interactive discussion! :) Please feel free to comment with more than just your answers to the questions! I'd love to hear your random thoughts and opinions!!! Great news for you guys! I just heard back from the lovely Harper Collins and we've got a prize to share with the participants!!! And guess what?!?! 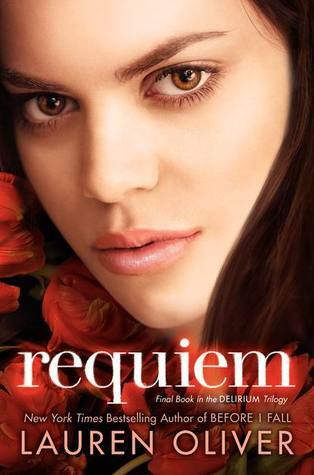 You can win a copy of the last book in the DELIRIUM Trilogy, Requiem!!! This contest is open INTERNATIONALLY - Harper Collins can only ship within US, but if an International participant wins, I will ship the book to them personally!